John Forney was a Lancaster printer's apprentice who became one of the nation's most influential newspaper publishers. His biography is the story of a Pennsylvania printer who becames one of the state's premier power brokers. John Forney is a towering figure in the history of the newspaper that eventually evolved into today's Intelligencer Journal and the Intelligencer Printing Company. John graduated from the pressroom to the boardroom in one giant leap of ambition. By age 22 he owned the Lancaster newspaper where he had first learned to set type as a teenaged apprentice. 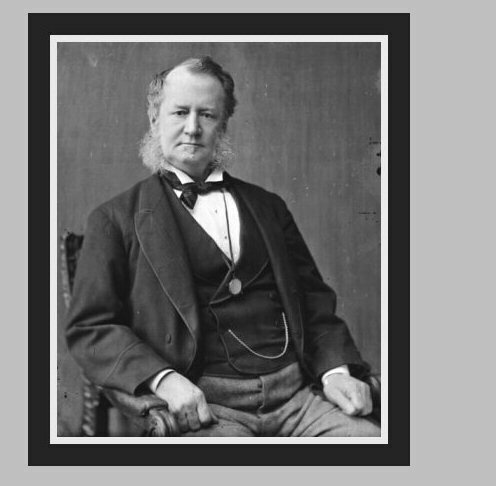 By age 40 he led the political campaign that placed President Buchanan in the White House. John Forney transformed his personal friend, James Buchanan, into America's 15th president. 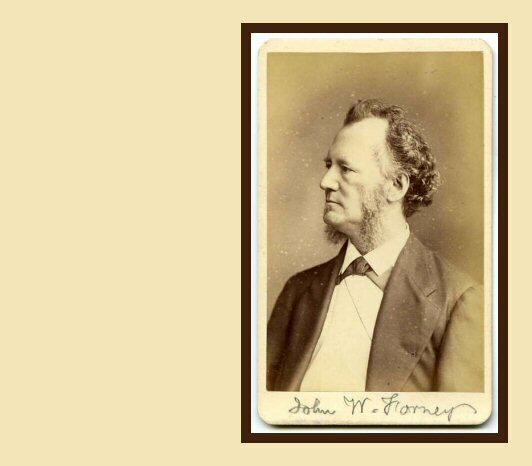 The best descriptons of John Forney are the 19th century praises penned by his colleagues. 1817: John is born in Lancaster into a Pennsylvania German / French Huguenot family. By age 13 he leaves school to help support his widowed mother. 1837: John purchases Lancaster's Intelligencer newspaper. 1845: John leaves Lancaster and relocates to Philadelphia. He purchases half interest in the Pennsylvanian, a Democratic newspaper, which he owns for 8 years. 1851: John is elected clerk of the U.S. House of Representatives, so he and his family move to Washington D.C., where he becomes the presiding officer of the House. 1852: John becomes an editor of the Democratic party's Washington Daily Union newspaper. 1855: John leaves his job as clerk of the U.S. House of Representatives. He is chairman of Pennsylvania's Democratic party, and leads the state's presidential campaign of his personal friend and fellow Lancastrian, James Buchanan. 1856: James Buchanan is elected U.S. President, and John Forney is given most of the credit for Buchanan's campaign victory. 1857: John campaigns to be a U. S. senator, but he loses to another former Lancaster printer, Simon Cameron. John returns to Philadelphia where he starts a Democratic newspaper, the Press. 1861: John returns to Washington D.C., after becoming a Republican, and serves as secretary of the U.S. Senate for 7 years. He creates the Washington Sunday Morning Chronicle, to support President Abraham Lincoln. 1861 to 1868: John is Secretary of the U.S. Senate. 1870: John sells his Washington newspaper, and returns to Philadelphia, where he creates and edits a weekly magazine Progress. John switches political parties again, to Democrat, for the last years of his life. 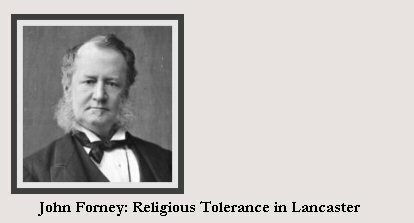 In 1855 John Forney returned to his hometown of Lancaster to deliver this powerful speech in support of cultural diversity and religious tolerance. In this highly-emotional speech, John commands his fellow Lancastrians to remember the ideals that created Pennsylvania and Lancaster County: ideals that transformed this region into a powerhouse of diverse nationalities, religions, and creeds. In this speech John lashes out at the bigotry of the "Know Nothing" political party, a xenophobic, nativist party that was anti-Catholic, anti-Irish, and anti-immigrant. John demands his fellow Lancastrians remember the Quaker ideals of William Penn, who created Pennsylvania to be a haven for all, regardless of religion or ethnicity. John Forney (a Protestant) demands civil rights for Catholics, and for all religions in America, even though that same Catholic Church and State fought his French Huguenot ancestors in Europe. John turns the other cheek. William Penn and Amish historians would approve. Of course, the big Jeffersonian paradox in all this, is that in this same speech, John reminds us that he supports slavery in the South; his Democratic party insisted the Southern states be allowed to keep slavery, rather than risk the destruction of the Union. These were complicated times. This speech was published at the request of George Michael Steinman, one of Lancaster's most prominent businessmen. He operated Steinman Hardware, at the site of today's Pressroom Restaurant, my favorite newspaper-themed restaurant. The restaurant is Here and Here. George Steinman was half-brother of Andrew Jackson Steinman. Eleven years later, this Andrew Jackson Steinman would be the first Steinman to enter the newspaper business, when in 1866 he became co-publisher of the Lancaster Intelligencer with Henry Smith.